Never lose your favorite lure while fly-fishing! The last 2 pictures show the original YakMag. Lures pictured only for demonstration, and not included. ~ traditionalnick. - Pins to your waders to secure your lures while fly-fishing. Brilliant colors:Brilliant colors and realistic crankbait with lifelike bait fish swimming action to attract fishes which can be used in both saltwater and freshwater. 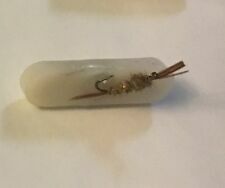 1 x Hard Fishing Lure. Diving depth:0-3M. (Other countries or remote areas may take longer). Hook:#6 high carbon steel Treble hook. 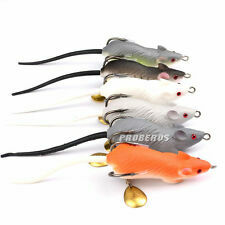 6 pcs Fishing Lure. (Other countries or remote areas may take longer). High Quality and Durable! Brilliant colors:Brilliant colors and realistic crankbait with lifelike bait fish swimming action to attract fishes which can be used in both saltwater and freshwater. 10 x Hard Fishing Lure(2PCS per color). 2016 Top Mice Lure Fishing Bait 6pc/lot soft bait 6 color fishing lure with Box 2.7"-6.86cm/0.41oz-11.64g fishing tackle. (Other countries or remote areas may take longer). (Other countries or remote areas may take longer). Swimming Depth: Topwater. Swimming Depth: Topwater. Type: Popper Lures. 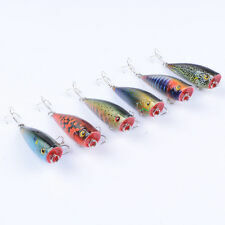 6pcs Fishing Lures. Weight: 7g. Weight: 6cm. Fishing places: Rivers, lakes, reservoirs, ponds and streams and other freshwater places. Easy to fish by barb hook. Swimming Depth: Topwater. Hook: 6# High Carbon Steel Treble Hook. Material: Plastic. Condition: New and High Quality. Hook:#6 high carbon steel Treble hook. Easy to fish by barb hook. Strong and sharp, like the real fish. Not easy to be broken, can withstand heavy fish. (Other countries or remote areas may take longer). Hook: #6 high carbon Auchin steel hook. (Other countries or remote areas may take longer). Hook:#6 high carbon steel Treble hook. Easy to fish by barb hook. Strong and sharp, like the real fish. Not easy to be broken, can withstand heavy fish. The quality is very good, it experienced precision processing. Diving depth: Topwater. Hook: 6# high carbon steel triple hook. Easy to fish by barb hook. (Other countries or remote areas may take longer). New Arrival! Anti-corrosion, durable and practical characters. Swimming Depth: Topwater. 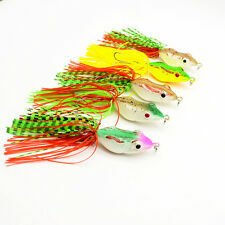 5pcs Fishing Lures. Hook: 6# high carbon steel Treble hook. Fishing places: Rivers, lakes, reservoirs, ponds and streams and other freshwater places. Easy to fish by barb hook. Swimming Depth: Topwater. Hook: 6# High Carbon Steel Treble Hook. Material: Plastic. Condition: New and High Quality. Weight: 7.5g. Hook: #8 high carbon Auchin steel hook. Swimming Depth: Topwater. (Other countries or remote areas may take longer). -we will try my best to reply you as soon as possible. We will resolve any possible problem or accident for you as soon as possible. (Other countries or remote areas may take longer). -We will be the most sincere attitude to communicate with you. Swimming Depth: Topwater. Super Good for Snakehead. Hooks: High Carbon Steel Treble Hook. Material: Soft Plastic. we will try our very best to resolve any problems with you. Length: 5cm. Hooks: High Carbon Steel Treble Hook. Material: Soft Plastic. we will try our very best to resolve any problems with you. Hook: 6# high carbon steel triple hook. Diving depth: Topwater. Length: 8.5cm/pcs. Weight: 11g/pcs. (Other countries or remote areas may take longer). -We will be the most sincere attitude to communicate with you. Weight: 13g. Hooks: High Carbon Steel Treble Hook. Material: Soft Plastic. Condition: New and High Quality. Length:5cm /piece(Not including the tail length). (Other countries or remote areas may take longer). Weight:8.5g /piece. Hook:#10 high carbon steel anchor. Condition: New and High Quality. we will try our very best to resolve any problems with you. Hook: high carbon steel Treble hook Swiming Depth: Topwater. (Other countries or remote areas may take longer). Color: 6 colors available. (Other countries or remote areas may take longer). -we will try my best to reply you as soon as possible. (Other countries or remote areas may take longer). It is very worth your buying! High Quality and Durable! Swimming Depth: Topwater. (Other countries or remote areas may take longer). Color:5 color available. (Other countries or remote areas may take longer). Length:7cm/piece(Not including the tail length). Swimming Depth: Topwater. Type: Popper Lures. 4pcs Fishing Lures. Fishing places: Rivers, lakes, reservoirs, ponds and streams and other freshwater places. -We will be the most sincere attitude to communicate with you. Weight: 11g. Hook: 8# High Carbon Steel Treble Hook. Condition: New and High Quality. Swimming Depth: Topwater. Type: Popper Lures. 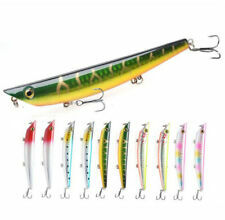 6pcs Fishing Lures. Weight: 7cm. Fishing places: Rivers, lakes, reservoirs, ponds and streams and other freshwater places. Easy to fish by barb hook. (Other countries or remote areas may take longer). Hook:#10 high carbon steel anchor. we will try our very best to resolve any problems with you. Swimming Depth: Topwater. Type: Popper Lures. 5pcs Fishing Lures. Fishing places: Rivers, lakes, reservoirs, ponds and streams and other freshwater places. Easy to fish by barb hook. (Other countries or remote areas may take longer).